You would think a second marathon would be easier to run than the first, but last year, I was so naïve. 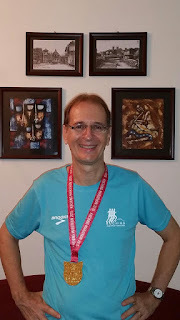 I over-estimated my abilities and under-estimated how much time it would take a normal person, let alone a writer who hardly trained, to run 42.195km, or 26 miles, 385 yards. Unlike last year, I knew firsthand the pain that awaited me. The aches and pains during the run, the post race cramps, the bigger pains climbing up and down those horrible stairs at home, not to mention the various blisters and losing three toenails. Still, I took the scolding albeit pep talk in a positive way – I mean he is my brother. So the follow­ing week­end I ran to Quop, my wife’s village, and back in one hour and twenty minutes with­out stopping. I found that encouraging, despite the two dozen roadkills, includ­ing three snakes, a scorpion, some birds, frogs, you name it, and a freshly killed white-breasted water-hen. Unless I wanted to be roadkill myself, I needed to take these marathons a little more serious­ly. I’m not as young or as fit as I was twenty years ago. Then again, who is? I sneaked in a second, shorter run before supper one evening, but the following day my left knee felt iffy, if not a little painful. For days, I applied generous doses of various muscu­lar salves and kept my fingers crossed that the knee would hold up. What didn’t hold up, on the eve of the run, was my running watch. Who remembers to change the battery before a mara­thon? I added that to my checklist for next year. Instead I had to wear my regular watch, a present from my wife, and watch it get doused in sweat. Then I found out that the organizers had changed the cut-off time from seven hours to six and a half! That meant my time last year (6:42) would not have qualified. So now I had to focus on running a new personal best just to get a darn metal! Maybe that was why I couldn’t sleep, despite trying all afternoon and evening until about 10:30 pm. Then it was rise and shine at 1:40 am! Last year, I got up at 1am, but I knew I needed that extra sleep. Did lack of sleep bother the Kenyans or the 3am starting time? Naturally the Kenyans swept the first six places in both the men and women’s races (and half-marathon, too). The winning time was 2:26.39, or about four hours faster that I needed to run. The winning time for Veterans (my category), also by a Kenyan, was 2:56.50. To make up some of that time, I made sure I started near the front. Last year, stuck some­where toward the back, with thousands of runners ahead of me, it took us about 10 minutes of inching forward just to get to the starting line where we could finally run. And run I did, determined to get off to a brisk start. Unfortunately, weighed down by a pair of bananas that I couldn’t finish and didn’t want to toss, my shorts started slip­ping, so I slipped between a pair of parked cars and tightened them. Those who saw me assumed I was taking a leak. Compared to last year, gone were the hordes of spectators at the beginning of the run and along the way, cheering us on. There were some, but the party-like atmosphere, the first date magic, was not there. Sort of like a second date. Gone were the roadkill, too, since they had recently paved several of the roads. However, there was a crashed car with the driver’s door left wide open; no doubt the driver had to be helped out. I hope he or she survived as I kept on running, counting my blessings. 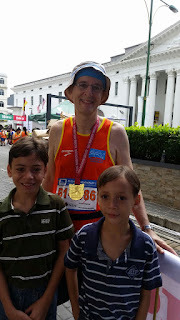 I also counted Water Stations (16), grateful for the volunteers who provided us cupfuls of water or isotonic drinks and kept us entertained by bang­ing empty bottles and chanting, “Faster, faster! You can run faster!” Every three kilo­meters, they posted the kilometer markers. I thanked each one as I passed by. At 15K, I told myself only 6K to the half-way mark! At 24K, only 6K to 30K! Playing these mental games helps. At 27K, I played a different game by announcing I was winning 9-5! 9 kilometer signs down, 5 more to go. At 30K, 10-4; 33K, 11-3. In my mind I was winning the race. Not against the Kenyans who had long since collected their prize money and gone back to bed. Running has always been more mental than physical, especially once you pass the 36K mark. By then, many runners were hobbling more than running; not a pretty sight as they willed their bodies forward, almost crablike, their necks jutting out, their arms or elbows flailing, their hands twitching, hoping their wobbly legs would follow so they didn’t fall flat on their faces. I knew I was well ahead of last year’s pace and thought for sure I could break six hours. Of course, had I properly trained like you’re supposed to (like my brother told me), this wouldn’t be a problem, but, alas, fatigue set in, compounded by lack of sleep. I woke up laughing when I spotted a runner’s t-shirt that asked, “Where the f**k is the finish line?” I knew that feel­ing. Having run in last year’s marathon, I also knew I could finish this one, too. That’s what mara­thons do; they give you that extra self-confidence. No matter how bad or painful things look, if you keep at it, putting one foot in front of the other, and vow you will never quit, you will make it. I apply this to writing novels, too. Success was merely waiting for me at the finish line. Also waiting was my wife and sons Jason and Justin. The boys kept asking her, “What’s taking Daddy so long?” She didn’t know, nor did she think, I was going to make the cut-off time based on my lack of training, lack of sleep. But then she saw me rounding the cor­ner, looking like her sweaty, exhausted marathon man from last year. To me, she looked like heaven. Other than some bleeding around one of the toenails, I was fine. No blisters! No lost toe­nails! I was even spared those dreadful cramps. More importantly, I had once again sucked it up (my mantra from last year) and persevered. This repeat performance will surely come in handy next year. The question is…will you be joining me? Just add running a marathon to your bucket list or your New Year’s Resolutions, then you can happily add it to your list of achievements. sorry won't join you; too high impact. i much prefer swimming no stress on the knees, ankles, or my iffy right achilles tendon. Congrats on the successful run! Thanks. Yeah, it does have it's drawbacks, which is why, one a year is somewhat manageable. I figured if this grandmother could run one a year from age 60 to 78,then I should look into it. Nothing like having someone's grandmother passing you. One elderly crablike lady who seemed like she was speed walking or on the verge of falling over more than running kept passing me. I told another runner, that's my motivation. I got to keep in front of her. Every time I saw her gaining ground on me and about to pass, I took off running. It worked. She also qualified for a medal! Sheer determination on her part. She put a lot of runners half her age to shame! A job well done for achieving another milestone in your life.